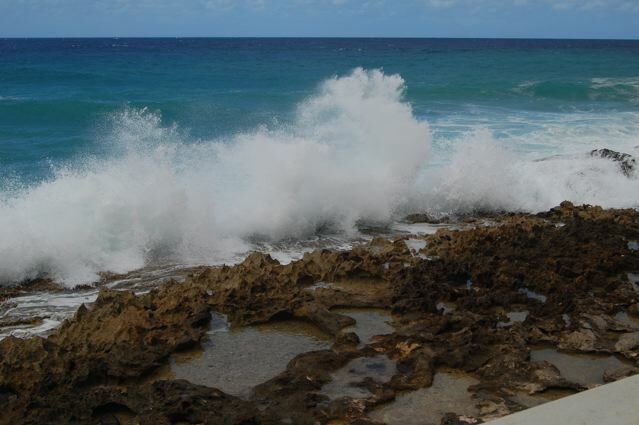 Friday night we drove down to St. Croix’s North Shore and pulled into the parking area for The Waves at Cane Bay. 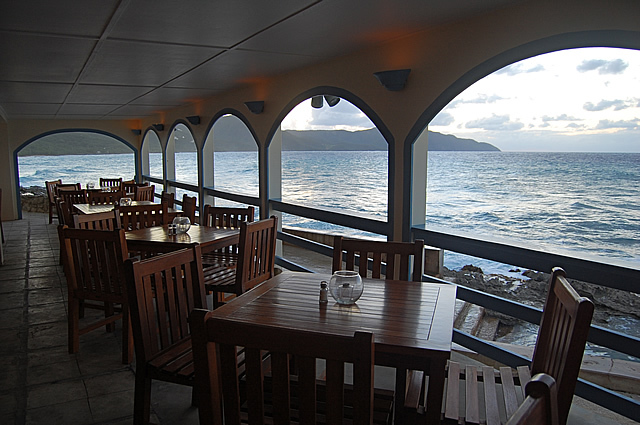 We think this is one of St. Croix’s best-kept secrets for dinner and drinks. 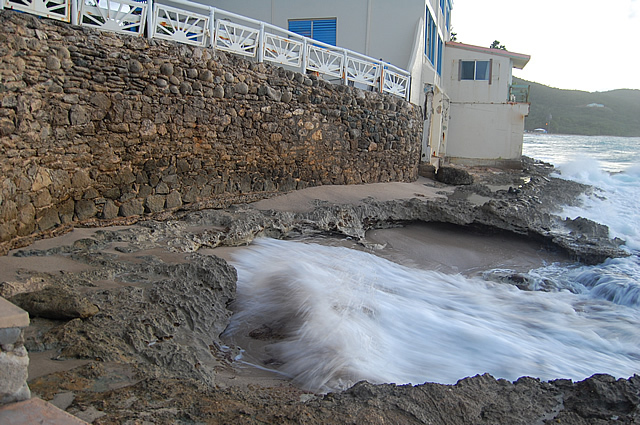 Most drive past The Waves with no idea what they’d find if they descended the stone steps beyond the parking area. Step down and you’ll see the view of Hamm’s Bluff across the ocean is incredible. Ten feet from our table the surf crashes into the natural swimming pool. Graceful arches, teak chairs, torches, crashing waves and a sunset over the mountains give a unique feeling that’s both intimate and romantic. We briefly met Laura, the owner, who has done a wonderful job of renovating with local stone and simple, elegant furnishings. Carl, or as he’s known to North Shore folks, Crazy Carl, waited on us with good cheer and excellent service. 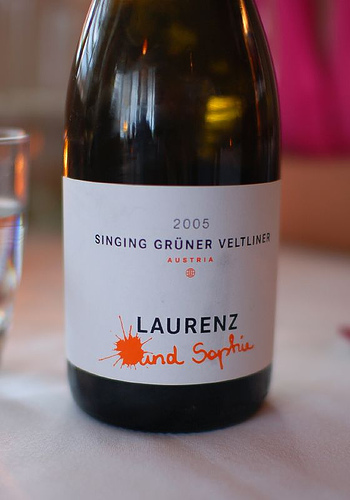 He also recommended an Austrian white wine named Laurenz V. Laurenz & Sophie Singing Gruner Veltliner, which I now highly recommend. So the setting is beautiful, but the food… wow! The gazpacho and conch chowder were flavorful and delicious. The shrimp and spinach crepes were perfectly prepared and creatively presented. The salt and pepper encrusted mahi on seaweed was the best mahi that we’d ever had. Our 13 year-old daughter realized it was the first time at a restaurant that she’d ever finished her entire entree (chicken and shrimp alfredo). And for dessert she had homemade cookies and cream ice cream… “the best she’d ever tasted”. This was the second time we’d had dinner at The Waves. Again it was outstanding. 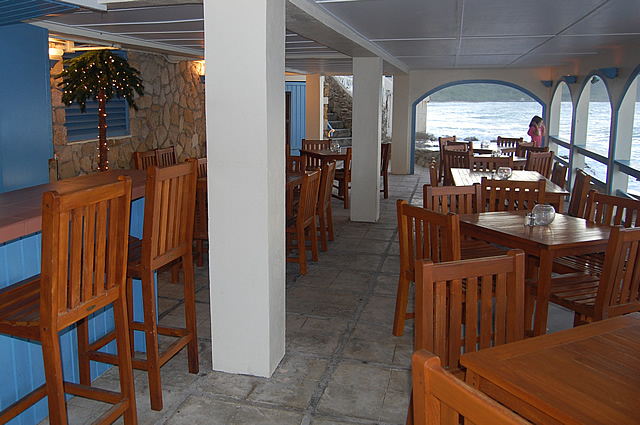 Another great night out for us–unbeatable view, great meal, excellent service, happy kids–what more could you ask for? For more information click for The Waves at Cane Bay. Below are a few photos we took of The Waves at Cane Bay. Click to enlarge…. 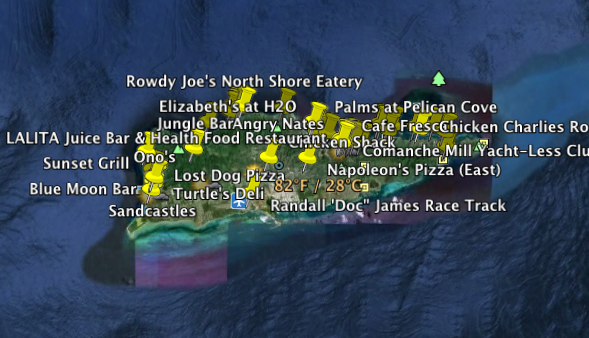 Just before Cane Bay is The Waves, a restaurant and small hotel. 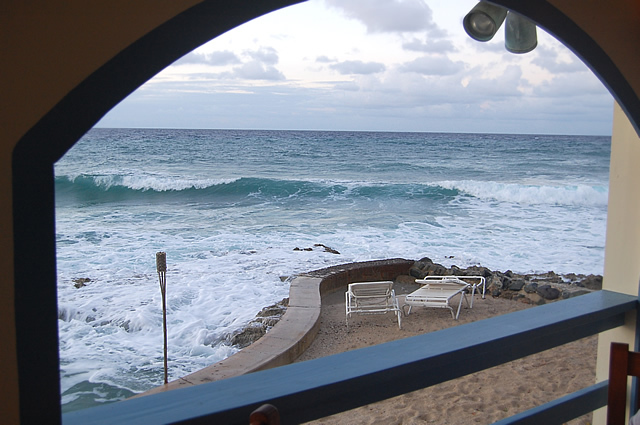 The location is right on the water and as the name implies… the waves roll in and break on the coral shoreline. 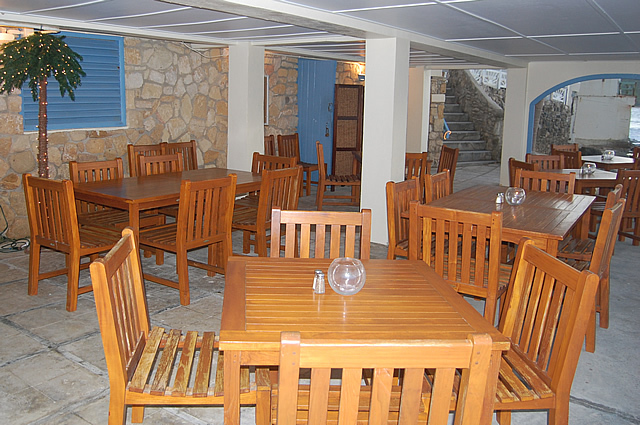 It’s a beautiful spot to have a few drinks, enjoy a great dinner and watch the sunset. The Waves at Cane Bay recently reopened after renovations. 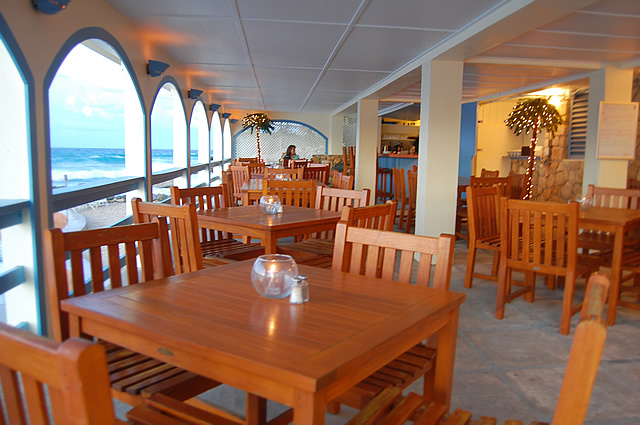 The oceanfront restaurant is beautifully renovated with a stone back wall, tiki torches, mahogany tables and chairs, and well kept grounds. 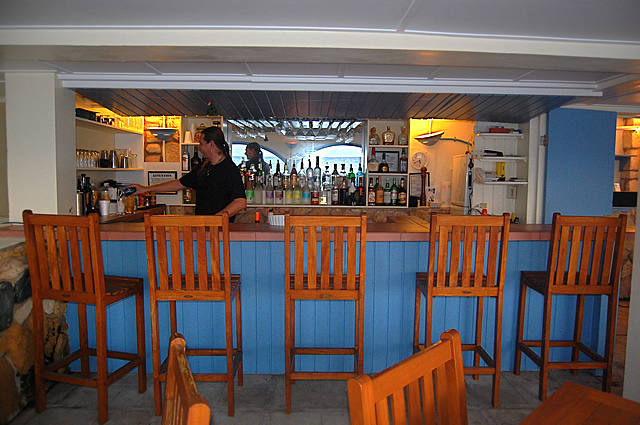 There is an intimate little bar if you prefer. 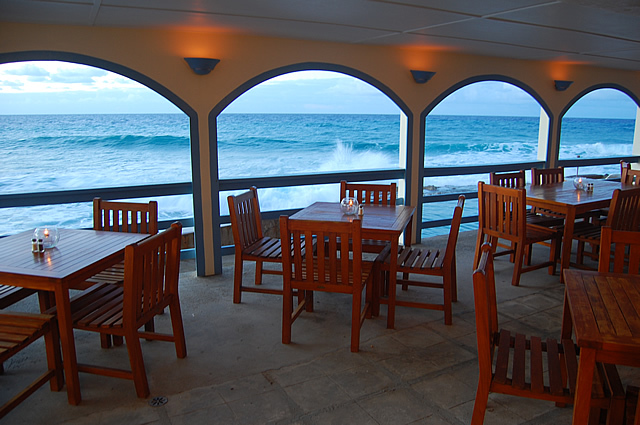 There are arched openings that perfectly frame the ocean and rolling waves. I’m told on a clear day you can see Vieques, Puerto Rico, St. Thomas and St. John. The menu ranges from steak to fish dishes in the $15-30 range. I had blackened Mahi Mahi which was perfectly cooked along with the most amazing broccoli I think I’ve ever had (after dinner I actually complimented the chef on how tasty it was). Service was good and dinner came surprisingly fast compared to some other St. Croix restaurants. 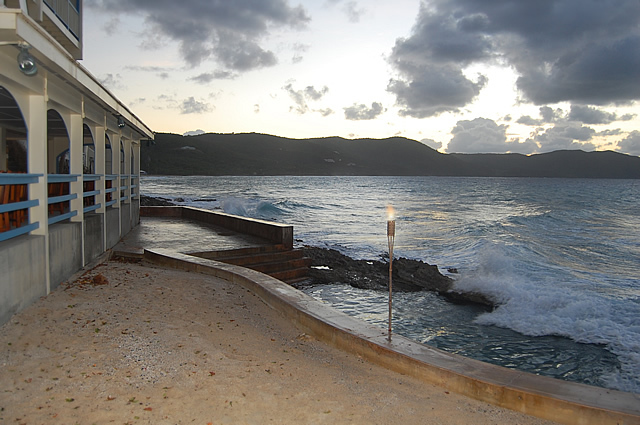 The restaurant overlooks their own natural salt water pool, one where the waves actually break over the reef and wash into the pool. And of course the star of the show is the view of Cane Bay Beach, the Hamm’s Bluff mountains and the incredible sunset. We were told the night before everyone saw “the green flash”. We waited with fingers crossed but no flash for us. Sunset was stunning anyway.